Click the button below to add the Pacsafe Camsafe Z2 anti-theft compact camera bag to your wish list. The Pacsafe Camsafe Z2 anti-theft compact camera bag is a versatile, single-compartment, top-opening bag with two padded touch-fastening dividers. 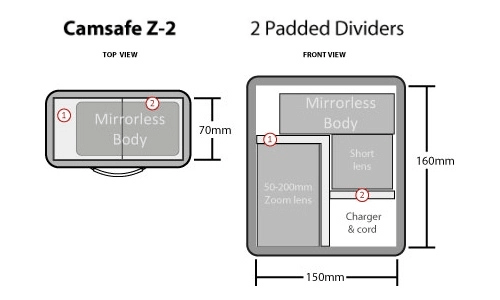 The Z2 camera bag will store and protect your mirrorless camera, two standard lenses and related accessories. The bag has a full-length, zippered, accessory pocket under the lid and there is also a zippered, exterior front pocket, and a key clip. The Z2 can be worn across the chest with its removable 50–76cm padded shoulder strap, carried with the top handle, or securely attached to a belt with a rear loop. The Pacsafe Camsafe Z series is a popular rugged design that, unfortunately, has been discontinued by Pacsafe. If you look hard enough you may be able to find a site overseas that may have one of these in the less popular sage green colour, but I challenge you to find anywhere else with any remaining stock in the more popular charcoal colour. Pacsafe products are known for their security features and the Pacsafe Camsafe Z2 anti-theft compact camera bag features numerous security features, which include, but are not limited to RFID-blocking material for protecting your credit cards and your passport's microchip from hacking, slash-resistant materials to foil thieves, quick-release buckles with dual-release buttons, and zipper pulls with eyelets for attachment to discreet security hooks.